The 574 is a new layout in Lunar‘s Quasar portfolio for 2016, introducing the very popular transverse island fixed bed into the entry-level range bearing the Lunar name (Venus being a standalone brand). 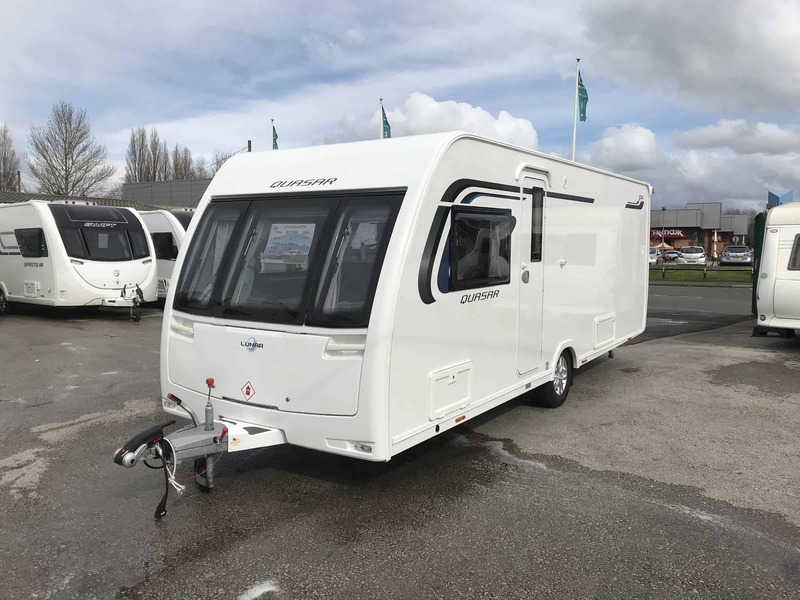 Known for making lightweight tourers, weighing in at 1390kg the 574 is within the capabilities of many family tow cars. The Quasar now shares the attractive body shell of its upmarket siblings, which in our opinion looks both classy and restrained. 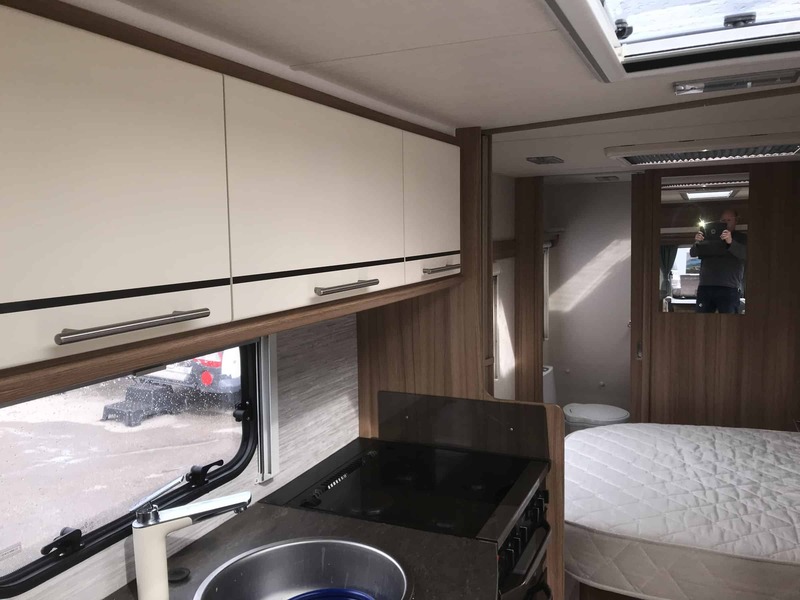 Lunar has resisted following the trend of other manufacturers for sunroofs, but has instead installed the ultra-long Skyview rooflight, which floods the interior with natural light, whilst at the same time allowing the retention of useful overhead front lockers. 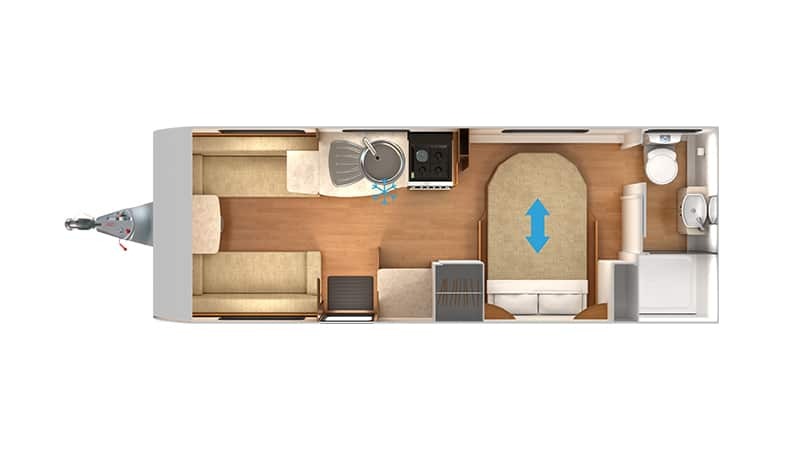 Marketed as a four-berth, but likely to be used in the main by couples, it’s time for us to take a closer look at the 2016 Lunar Quasar 574. And to see other Lunar caravans for sale, click here. 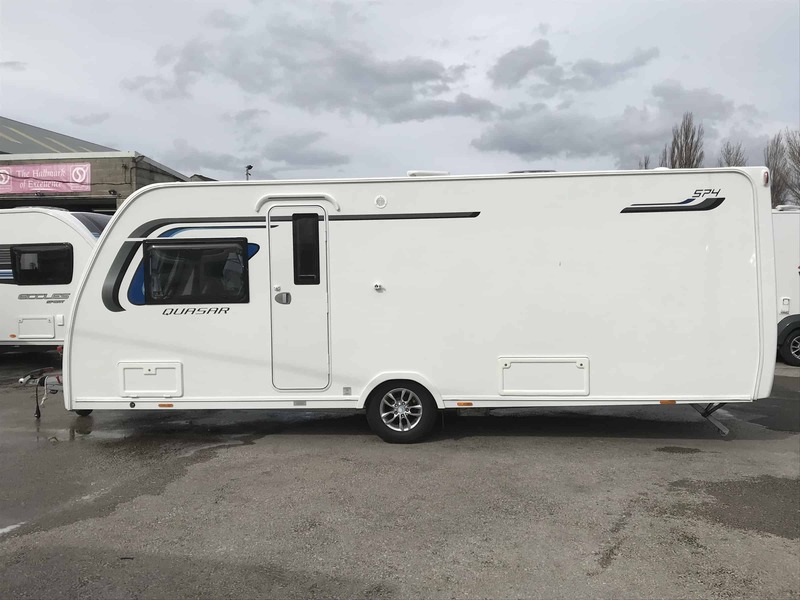 The 574 is a good looking caravan, helped by restrained graphics and smart alloy wheels, although inevitably with this layout there’s a good slab of white sidewall on the nearside. It’s built on Al-Ko running gear, incorporating an AKS3004 stabiliser, buttonless handbrake and spare wheel. A step-on A-frame aids cleaning. Unsurprisingly at this level, though, the ATC stability control is an option. There’s no external gas barbecue point, but you do get a wet locker on the nearside which also houses a mains socket. 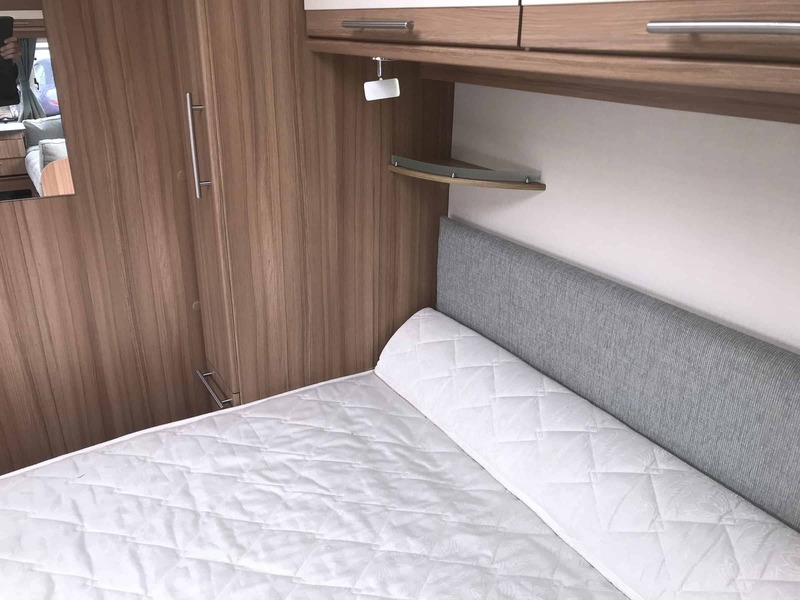 An external hatch further back gives access to the space under the fixed bed. The large front locker hinges upwards and is supported by gas struts. All of the services are well placed on the offside, and are easy to access, as are the lightweight corner steadies, while the main controls are located just inside the entrance door. 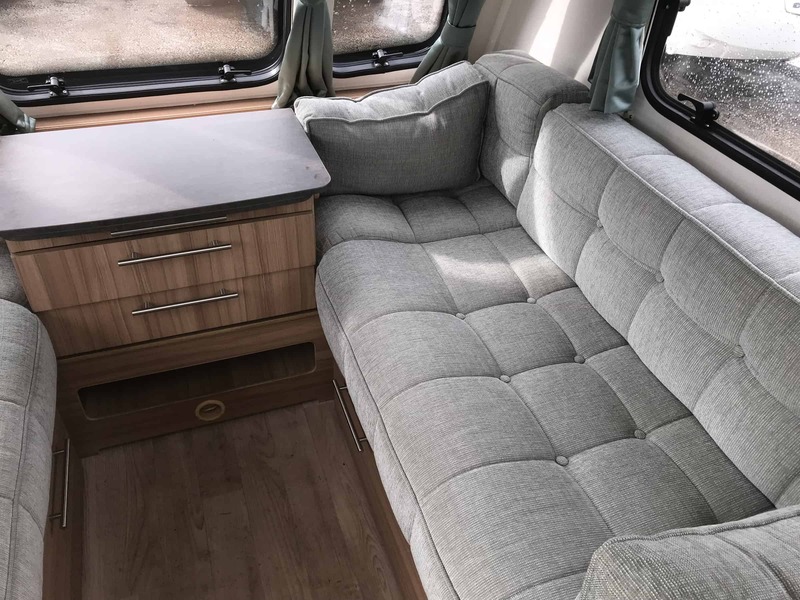 Fixed-bed layout caravans don’t normally have huge lounges, and the Lunar Quasar 574 is no exception. However, thanks in part to the grey/green furnishings and that huge Skyview rooflight, the lounge feels spacious. 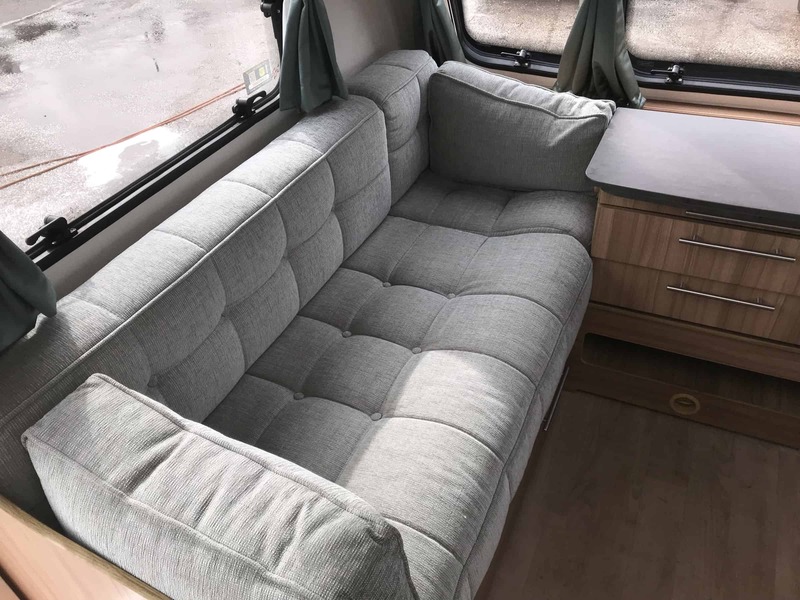 Four could sit in perfect comfort, and it’s also worthy of note that the main table is stored at the lounge end of the kitchen, so it is right where you need it. Lunar is to be commended on the provision of three TV points in the 574, each with satellite dish connection. One is on the wide front shelf, with the second on a small dresser unit next to the entrance door. The third is in the bed area. Artificial lighting is well catered for too, with wall lights, four reading lights and dimmable ceiling lights; all LED, of course. Overall, we think the Lunar Quasar 574 is a very nice place to be. You’d never know that the Quasar is Lunar’s entry-level range, especially if it was judged on its kitchen. It has a Thetford Aspire 2 dual-fuel hob with separate grill and oven, and a good-sized Dometic fridge/freezer. A microwave is located opposite the kitchen above the dresser unit, and it’s set at a sensible 1.25m from the floor. Although not over-endowed with work surface space, the drainer is removable, which leaves a reasonable amount of space for food preparation. There’s a single socket for a kettle. 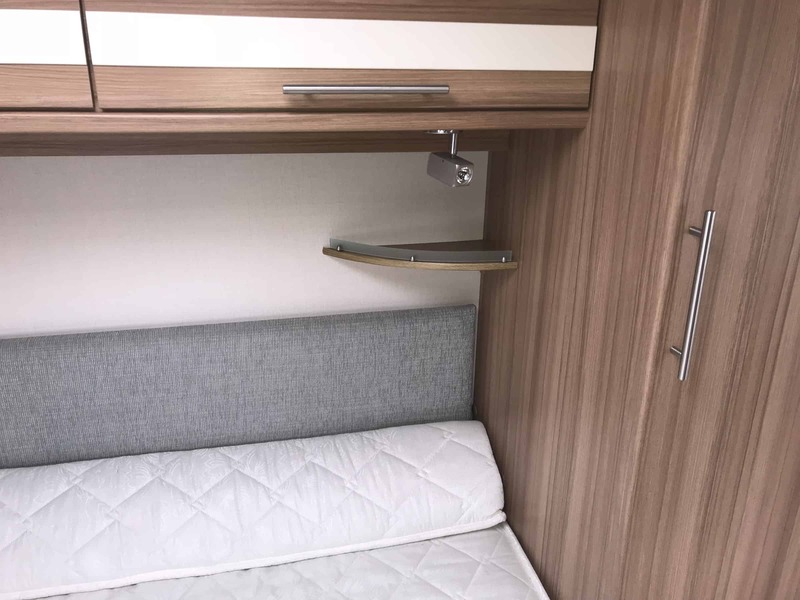 Three overhead lockers provide good storage for crockery, cereal boxes and the like, whilst there’s a pan cupboard and a shelved cupboard within the kitchen unit. If that’s not enough storage space, there’s always the cupboard in the dresser opposite. In addition, lighting and ventilation are well catered for, too. 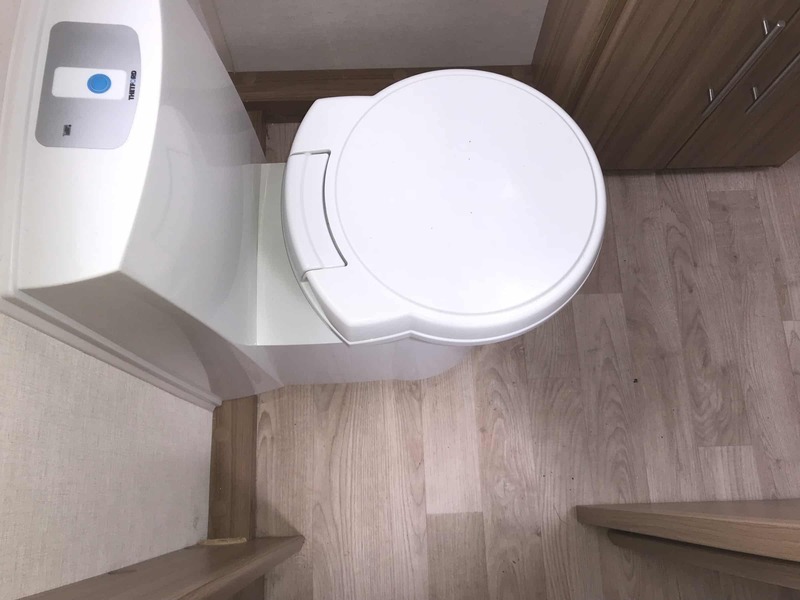 Given the size of the caravan, the Lunar Quasar 574’s washroom has a very airy and spacious feel to it. 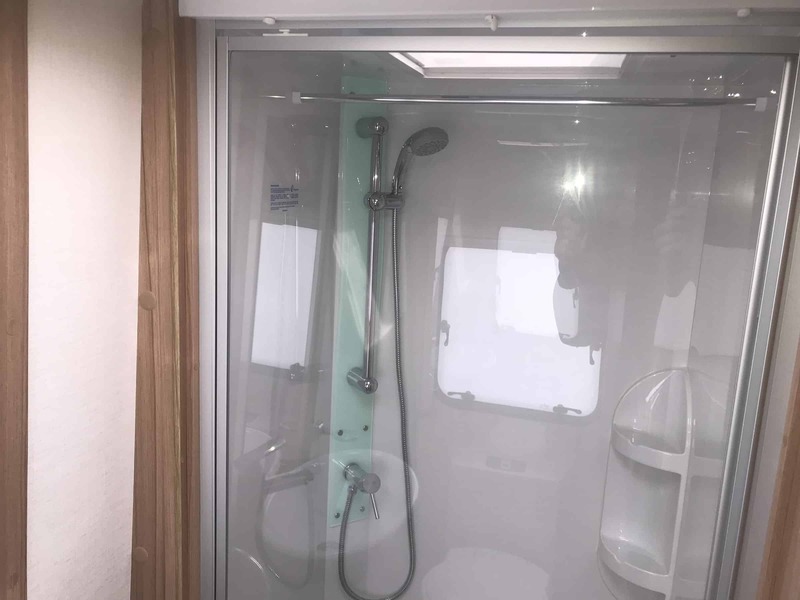 The fully-lined shower cubicle has a large single door, and has a couple of shelves for shampoos, gels and the like. The shower (with an EcoCamel head) is mounted on an attractive green panel. It also has a roof vent and its own light, and a rail for hanging wet towels. 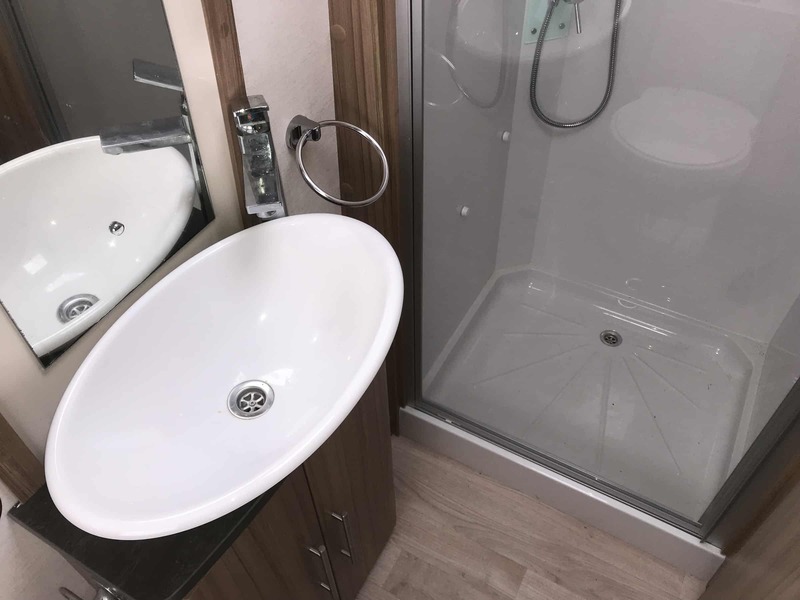 The vanity unit is surmounted by an attractive top mounted bowl, while the unit itself has a cupboard which is large enough to swallow washroom paraphernalia. An electric flush Thetford toilet is sited just inside the sliding entrance door. Ventilation is taken care of by an opaque opening window behind the toilet, plus a mini-Heki rooflight. Artificial lighting is good, and is operated by a single pull cord. Transverse island beds are very popular, and it’s easy to see why. Either occupant can get out of bed without disturbing the other. The only downside is that they can either be too short (leaving room to manoeuvre around the bottom at night), or it can be a faff getting to the washroom as it’s a tight squeeze. In the case of this 574, the 1.83m x 1.37m double bed retracts by 19cm during the day, which leaves a decent walkway through the bedroom. When the bed is extended, there’s about 19cm to get through, although this isn’t helped by the boxing for the blown air ducting. That aside, each occupant gets a reading light and a small shelf for the morning cuppa. As we noted earlier, there’s a wall mounted TV point near the foot of the bed. Up front, there are either two very short singles (measuring 1.54m x 0.68m each) or a 1.97m x 1.13m make-up double. 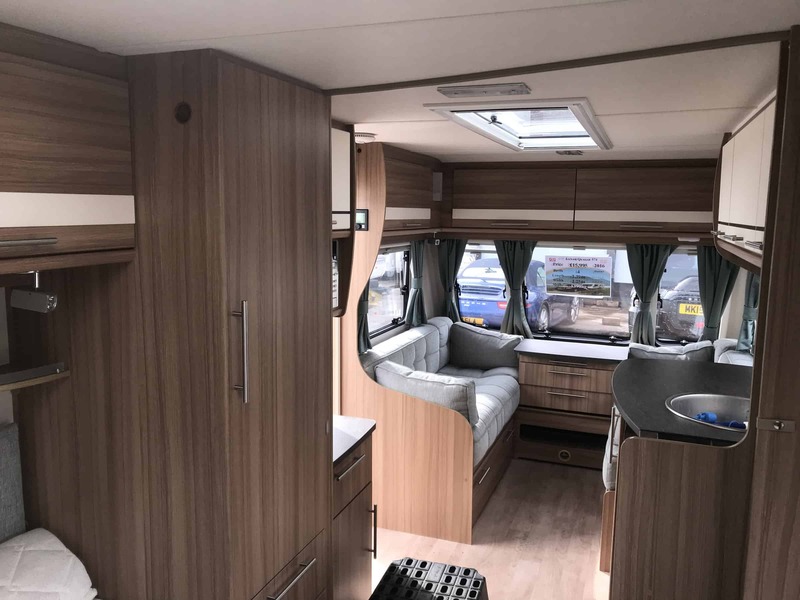 There’s more than enough storage for a caravanning couple irrespective of the time of year in the Lunar Quasar 574. As there’s no front sunroof, there are a couple of overhead lockers running across the front (one containing the radio). There’s one on either side of the lounge too, both being shelved. Apart from the wet locker encroaching a bit, the nearside seat base is empty, so you’ve some space there. However, the offside one offers little storage, as the heating/electrics are located under there. Moving into the bedroom area, there are his ‘n’ hers wardrobes with a drawer and cupboard under each, and a pair of overhead lockers over the bed head. Then, of course, there’s the void under the fixed bed. 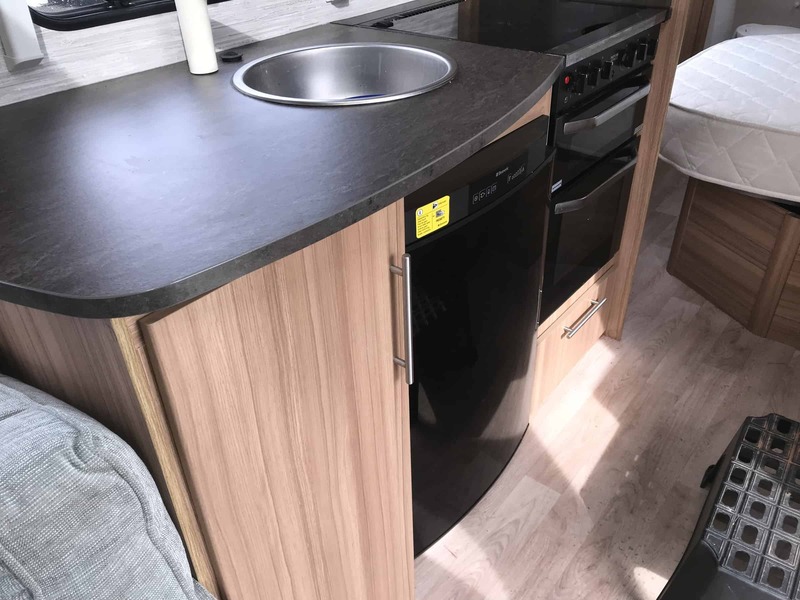 Add in the kitchen, the dresser and the front chest, and we’ll bet that there are empty spaces even when packed, ready for your caravan holidays. 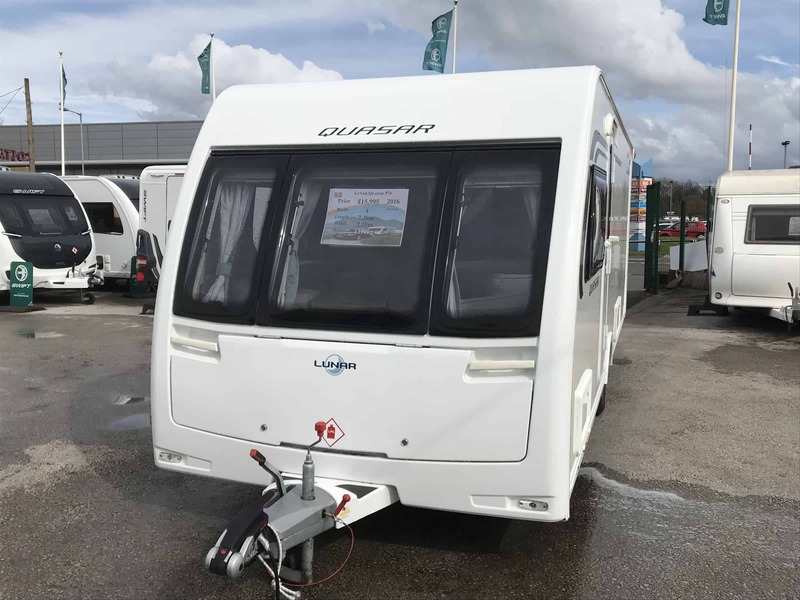 We’ll cut to the chase here: the Lunar Quasar 574 is one cracking caravan. It looks great, and feels really spacious. The fact that it’s reasonably lightweight and well-priced for the specification adds to that conclusion. 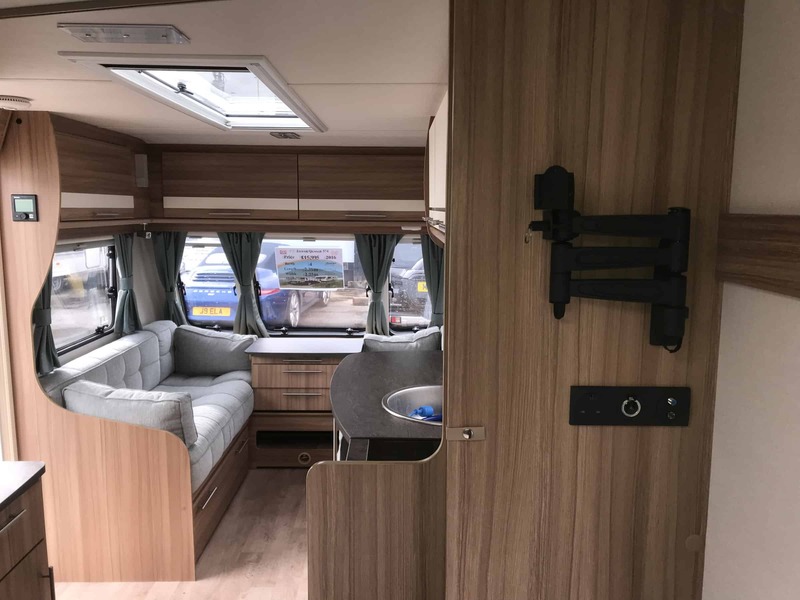 It might not have all the bells and whistles of its upmarket siblings, but it really does have everything that you’d need for comfortable touring, and more. Possibly the only option that we’d tick is for the ATC stability control. And once inside, it’s clear that the Skyview rooflight floods the interior with light, but allows the retention of useful overhead lockers. 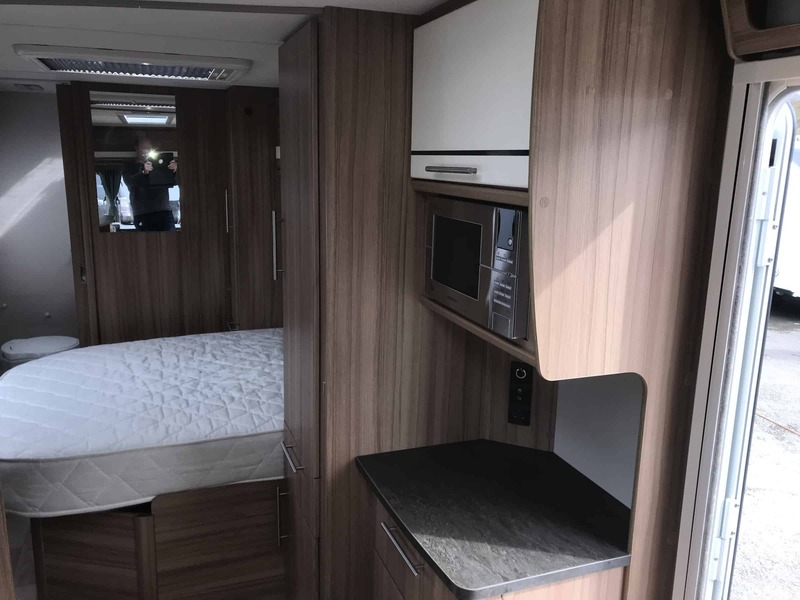 If you’re in the market for a transverse island fixed-bed, mid-market caravan, then the new-for-2016 Lunar Quasar 574 really must be on your shortlist.